Dr. Cindy Lee Van Dover is a deep-sea biologist with an interest in the ecology of chemosynthetic ecosystems. She began her work in this field in 1982, joining the first biological expedition to hydrothermal vents on the East Pacific Rise. After earning a Master’s degree in ecology from UCLA in 1985, she continued her graduate education in the MIT/Woods Hole Oceanographic Institution Joint Program in Biological Oceanography. There she joined numerous expeditions and published on diverse topics such as reproductive strategies and recruitment of vent invertebrates, vent food webs, and taxonomic descriptions of new species. In 1989, she described a novel photoreceptor in a vent invertebrate, which in turn led to discovery and characterization of a geothermal source of light at vents and investigations of its biological significance. On receiving her Ph.D. in 1989, Van Dover joined the group that operates the deep-diving submersible ALVIN. She qualified as pilot in 1990 and was pilot-in-command of 48 dives; she now serves as Chair of the Oversight Committee for an upgrade ALVIN vehicle. Her work with ALVIN and other deep submergence assets has taken her to the seafloor in the Atlantic, Pacific, Indian, Arctic, and Southern Oceans. 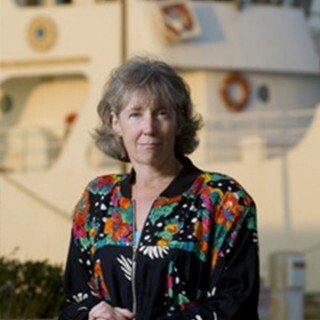 Dr. Van Dover’s current research focuses on deep-ocean exploration, the study of gene flow and connectivity of deep-sea organisms, deep-sea conservation and environmental management, and, most recently, exploring new models for deep-ocean research through telepresence, distributed research teams of early career scientists, and social media. She has published more than 100 articles in peer-reviewed journals and is an active participant and Chief Scientist in NSF-and NOAA-sponsored field programs to hydrothermal vents and other chemosynthetic environments. In addition to research, Van Dover has authored a popular book for the lay audience about the deep sea and her experiences as an ALVIN pilot (Deep-Ocean Journeys; Addison-Wesley, 1997, a.k.a. The Octopus’s Garden). She is the author of the first textbook on hydrothermal vents (The Ecology of Deep-Sea Hydrothermal Vents; Princeton University Press, 2000), is curator of ‘Beyond the Edge of the Sea’, a traveling exhibition of original deep-sea art by watercolor artist Karen Jacobsen, and is helping to develop Art and Science: Envisioning Ocean Depths, a mixed media exhibition. Dr. Van Dover is a Fulbright Scholar and Fellow of the American Association for the Advancement of Science. She is currently the Harvey W Smith Professor of Biological Oceanography in the Division of Marine Science and Conservation of the Nicholas School of the Environment, Duke University, where she serves as Chair of the Division and Director of the Marine Laboratory.